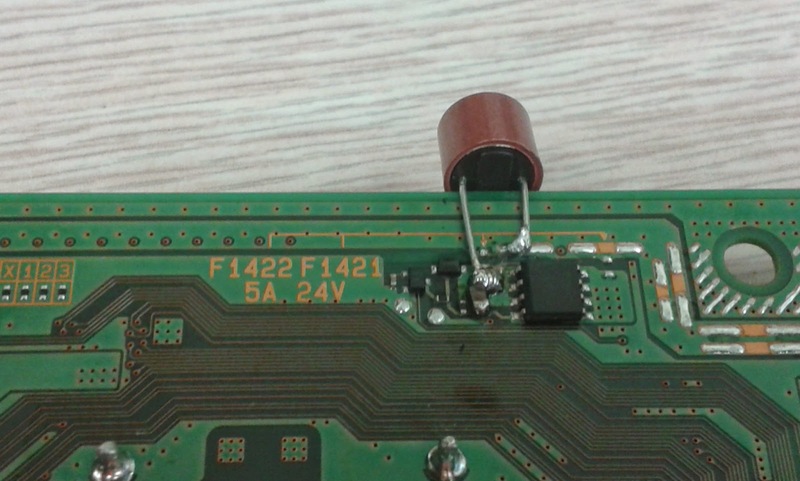 This article is a quick visual guide done for the benefit of one of our customers who had sent a T-CON board T400HW01 V3 / 40T02-C05 / 55.40T02.C06 from Sony KDL-40Z4100 for repair. Normally when that T-CON board T400HW01 V3 / 40T02-C05 / 55.40T02.C06 goes bad the result is color distortion, "solarized" images or , in some cases, washed out picture, but in this case customer reported that the TV would start normally, play sound, but nothing would show on the screen and then it would shut down on its own. We received the T-CON board , stuck it in our TV and got the exact same result - the TV would come up for a few seconds, no image at all, then it would shut off. Turned out the board was pulling too much out of the 12V power supply rail due to a problem. When we located and resolved the reason for that and put the board back in the TV it still did the same thing. It turned out it was not supplying 12V to the T-CON board anymore, so we pulled out the main board from where the 12V come and started tracing. Eventually, it turned out that there is a fuse on the 12V rail to the T-CON T400HW01 V3 / 40T02-C05 / 55.40T02.C06 on the main board and that it was blown open. 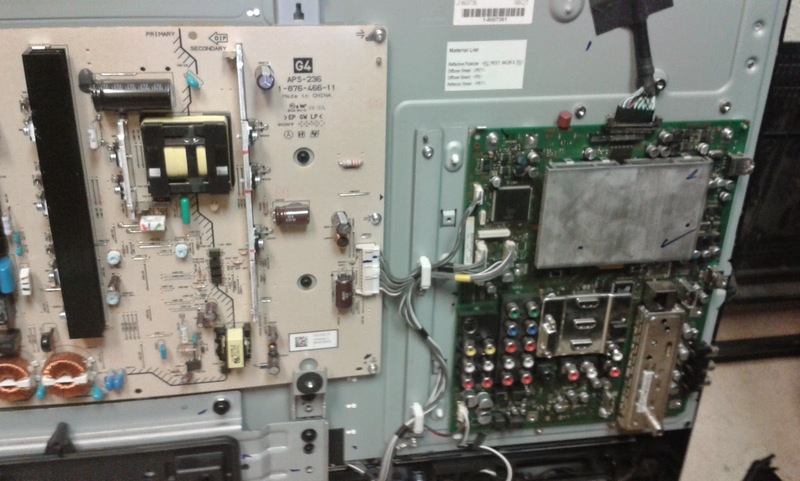 This picture is of the back of a Sony KDL-40Z4100; you can see where our fuse shows above the top middle of the main board. This is the back of the main board from a Sony KDL-40Z4100. You can see the label of the 12V fuse F1422 and our patch over it. After installing a replacement fuse as shown above the TV stayed on and we got a good image with our own testing T-CON board . Alas, customer's board was still showing image with too much brightness / wash out, which was not caused by the usual problem in the alpha control IC; we are still trying to figure that out and will eventually succeed. But you should know that if your Sony KDL-40Z4100 tends to shut off within a few seconds after it is turned on and shows nothing on the screen even though the backlight comes up then you should check that fuse on the main board. Do we want to buy your old TV main or power or other boards? Find out! The quick answer: yes, as long as they are valuable to us (rules out all tube and projection TVs) and we get them dirt cheap, preferably free. For the long answer read below. With new TV prices breaking new lows every quarter and economy in a happy bubble again (the US deficit at an 8 year low, wooo, but still a deficit!) more and more TV repair shops around the country are closing doors. Twice this week we received calls from people asking us if we want to buy old boards from them. "I HAVE SOME POWER SUPPLY BOARDS THAT I'D LIKE TO SELL. DO YOU BUY MAIN OR POWER SUPPLY BOARDS? THANK YOU. " Well I do not know how good of a businessman I am. I guess I am ready to assume not the best one since I do not put profit on top and do not look at every opportunity to maximize profit. Solicitations like this one to buy their overstock/liquidation/about-to-be-trashed boards rarely ever end up with an actual deal. Unless the offering party is a professional liquidator, in which case the approach looks differently, it quickly gets to a discussion about what is what what and that can drag for way too long to be worth the few or more boards one would acquire. Then there's the uncertainty in the buyer about whether those boards really what the seller says they are; the buyer usually needs to assume worst case scenario, especially in an unsolicited offer like that, and in my limited opinion, they better do that. Of course a honest and well technically educated person has all the right to be on the opposite opinion if they know the source and quality of their boards. But since people are not equipped with a character and quality judging devices - at least I know I am not and none of the people around me is - we can't tell good from bad and educated from truly believing in what they say. Let alone the con artists. 1) Make a good inventory list of what you have: part numbers and quantity at the very least, working condition if you can. 2) If you want to make the most out of your list start selling them by yourself on eBay, Amazon or wherever else you may see fit; that is the ONLY way to get anywhere close to what they'd be worth to an end customer. 3) If you want to sell to another business , then my advice is to decide how you want to sell them, i. e. as a whole lot or individual lots, e.g. main boards and power boards or Toshiba parts versus Samsung parts. There are pros and cons to each approach and as usual your best revenue would be somewhere in between one whole lot for one limp sum (little effort, quick sale, low profit) and too many individual lots (more profit, but also more time and more effort). The decision for that better be yours, though. 4) Make a list of the potentially interested parties; it can be as little as one, but it best be above 4-5; the more the better, only your time and will to add more should limit the number. 5) Make a listing for the lot(s) along with the inventory list on eBay or other auction site and THEN send a message to all interested parties. Set the starting price LOW to avoid pushing buyers off; if there's a real interest and real competition they'd bid over each other and you'd get fair market price. Note this does not put any of your buyers at an advantage or disadvantage to others; and you will end up getting a fair market value at the end. That is, this approach saves the whole process of individual negotiation and waste of time between you and a single potential vendor. God knows I am not the biggest fan of what eBay has grown to be; but the simple fact is that public bidding is an efficient and valuable tool when it comes to liquidation. In a number of articles before (e.g. this or this) I've written about the specifics of ordering from China. In a nutshell it is unpredictable unless you have your people there, holding others at the Chinese equivalent of a gunpoint (maybe a gunpoint?). One way to decrease those risks is to work with the same vendor and build mutual trust, educate them on how to avoid mistakes etc. However even then you are not guaranteed. We are working with the same vendor for many years now and have been together through a lot already. 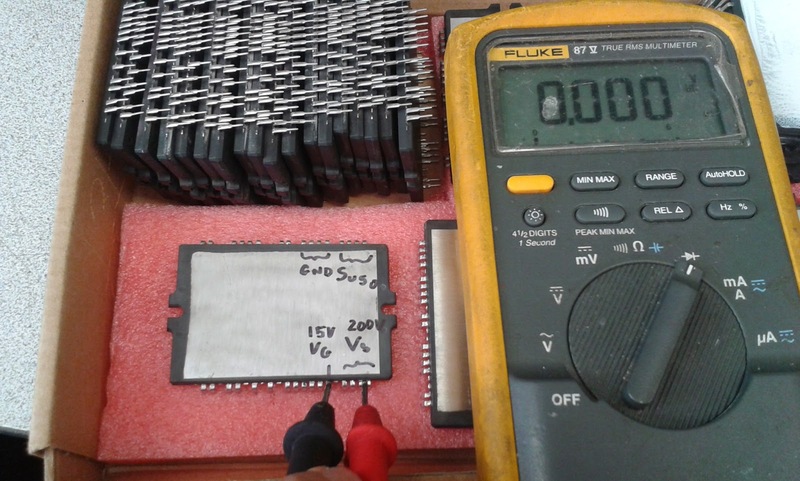 Which did not prevent us from receiving a batch of STK795-821 ICs that had a problem we have never seen before: a shortage between the Vs input power (200V) and the IPM control logic driving power 15V (often labeled Vg). 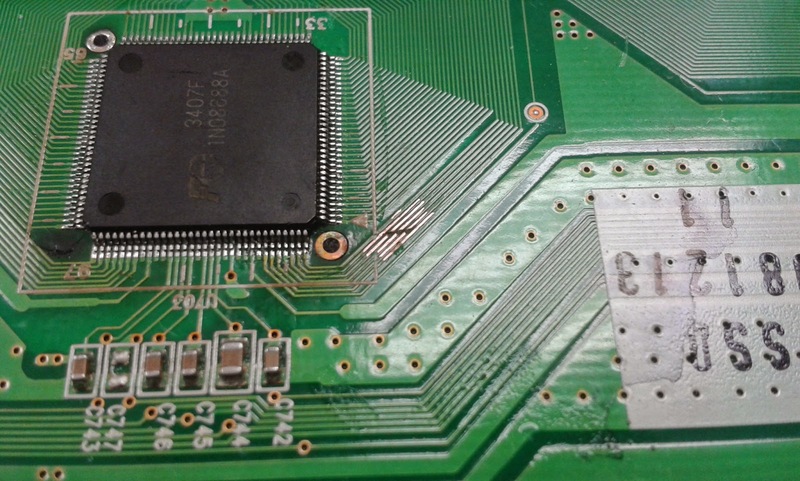 This is a picture of the bottom of a YSUS board 6871QYH053B which uses STK795-820 or STK795-821 or YPPD-J018C or YPPD-J018E etc. I am enclosing that picture here so that you can easily see the groups of pins on the IPM. Diode effect (one-direction resistance) between VER1/VER2 (they're shorted out on the PCB) and ER_DOWN_OUT; normally there should be infinite resistance in both directions, but an internally shorted FET would leave a diode in the circuit between the two. The effect would be flashing on the screen. A failed IC may also develop some other shorts, but rarely ever does or, more frankly, we rarely ever needed to search for clues other than the above. We've labeled the pins for you. There were 28 ICs with Vg shorted to Vs! Unaware of that, we just processed normally a repair service for a board and proceeded to testing the result. Wait a minute, what you sold me there? Second, you can bet that once you solder an IC that has a shorted Vg to Vs and test that in a live set, you will have A WHOLE LOT MORE damage than you originally started with. For a starter, the ZSUS board's IC will also fail since it uses the same +15V that are produced on the YSUS board and dispatched, through the plasma logic board, to the ZSUS; but everything , or nearly everything, that is on the YSUS and feeds from the +15V will likely also be damaged. 1) You better know what you're soldering on a board; it won't hurt you if you test everything that you know tends to fail. 2) You are definitely better off buying ICs from someone who uses them versus someone who just imports them and sells them; you are not guaranteed unless said someone tells you they've tested the IPMs and they are honest, but you are , by all means, better protected if someone is working with the same material that you're going to be using. We can't say with 100% certainty haven't sold a single IC of those to a customer, but chances are we didn't because we usually start using internally products from new shipments while continuing to sell the products from previous shipments - exactly for the sake of being first line of protection for customers. Of course that is still not a 100% certain because , like in this case, only one and a half box out of twenty happened to be bad. 3) You can make a mistake even when working with a trusted vendor; that is because they themselves work with local vendors sometimes; of course that also means you would be better off being a first tier, but in many cases that is simply impossible. Yet working with a trust vendor helps a lot resolve the problem and they would often times walk an extra mile to cushion any and all losses. 4) Maybe a bit strange for some, but for me this is a great illustration of why we should NOT warrant ICs once they are on a board. You see, a number of things can be bad on a board or in an IPM; to date I see some of my own technicians occasionally short two pins when soldering. Not those particular two, because they are quite apart, but certain other two are just sufficient. The result would still be a failed board, sometimes filed buffer etc. Any mistake - be it internal or induced - can cause a lot of damage. A responsibility line must be drawn somewhere and I do not see a better place of running heavy current through the IPM. 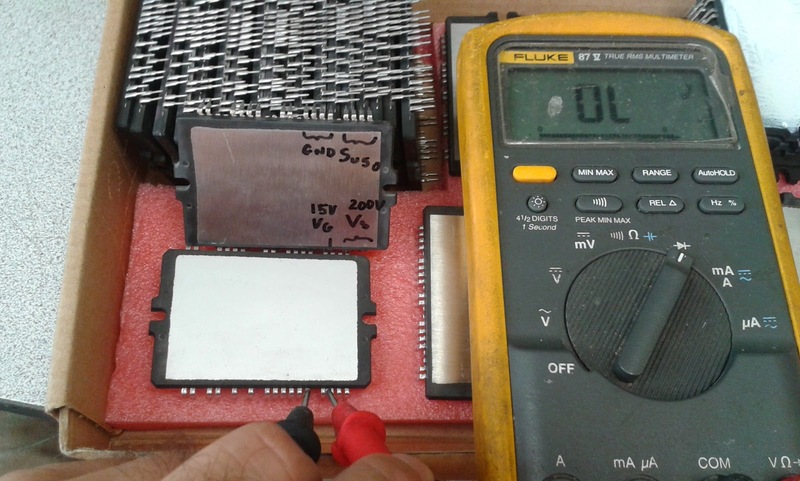 We can't easily catch this particular case and the next best is just soldering the IPM on a board. 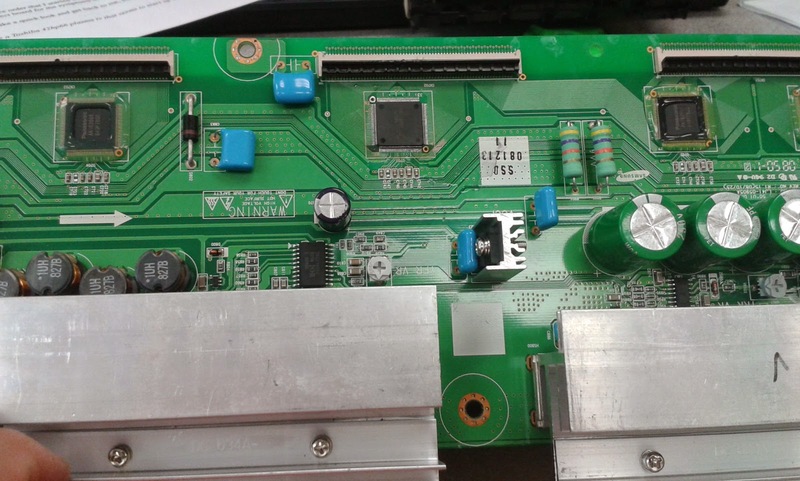 This is a Samsung Y-Main board LJ92-01601A used in Samsung PN50B450 and others. It has an embedded YSUS buffer. 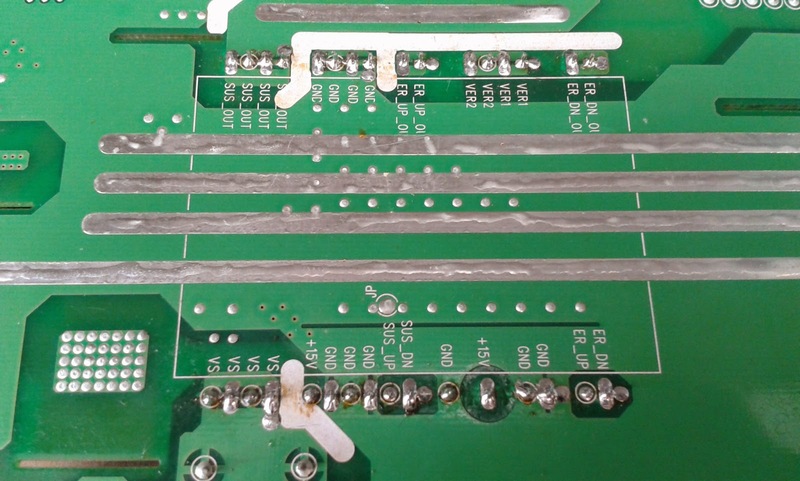 There was simply a cut through the PCB that has disconnected 4 tracks. This picture is made after we've removed the silicone, cleared the tracks and prepared them for connection. The IC did NOT seem to have been reworked, but I can not see another explanation of how this could have happened. Good luck in your own repairs!